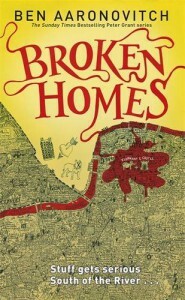 'Broken Homes' by Ben Aaronovitch - I missed Peter Grant's world of magical policing! "This book is dedicated to all the people who get up and do something about it, whatever “it” is and however small the thing it is they do." With this perfect dedication, Broken Homes - the fourth entry in Ben Aaronovitch's series about a snarky, geeky and ultimately good London Police Constable Peter Grant, employed in the subdivision of the Metropolitan police focused on magical side of the society - hit the high note from the very beginning and remained very good until the last page. 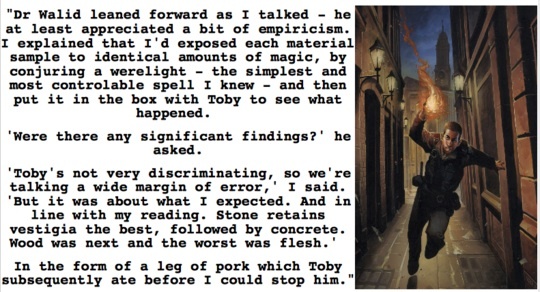 A few things always stand out for me in Aaronovitch's series and make his books quite special. First is the very distinct narrative voice of Peter Grant - a bit snarky, a bit smartass, full of endless geeky references and quite a bit of self-deprecating humor, and so captivating that, I swear, I'd read about grocery shopping and plumbing if Peter Grant was narrating it. "I’d love to stick some high vestigia material into a mass spectrometer, but first I’d have to get myself a mass spectrometer and then I’d have to learn enough physics to interpret the bloody results." Second is the unbelievably vivid atmosphere of the streets and buildings of architecturally beautiful multicultural London, described so lovingly and fully that even this non-Londoner reader feels that she just took a stroll along the Thames. 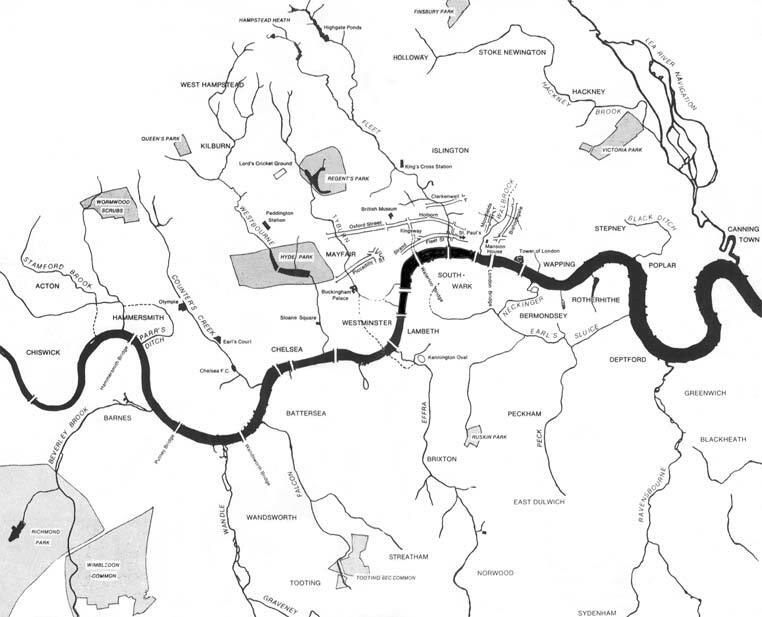 Speaking of the Thames - I finally decided to search for a map with all the 'lost' rivers of London, mostly tributaries of the Thames that had long ago been converted to underground rivers. And read quite a bit about Heygate Estatewhich provided inspiration for Skygarden Estate in this book. Third is the continuing emphasis on keeping these stories as much of police procedural as possible, with constant reminders that keeping the peace comes with the burden of regulations and paperwork and long hours spent gathering evidence and staring at miles of CCTV footage and juggling many different investigative threads that do not always conveniently come together to reveal a bigger picture. Mundane routine is the reality of police life, Aaronovitch emphasizes it, and his characters navigate the system in a way that makes you believe they are actually part of real-life police force. "It’s a police mantra that all members of the public are guilty of something, but some members of the public are more guilty than others." Peter Grant books avoid the common pitfall of so many stories that feature anyone with supernatural abilities: the immediate disregard of anyone not magical and resulting complete despising of police force as little but clueless buffoons good for nothing except for throwing obstacles in the way of the heroes. It's not so in Peter Grant series. Police force are the competent people who are perfectly capable of working side by side with their slightly more supernaturally inclined colleagues, even if it means creating just a tad more paperwork than planned. "So I waited in the porch and wrote up my notes. I have two sets, the ones that go in my Moleskine and the slightly edited ones that go into my official Met issue book. This is very bad procedure, but sanctioned because there are some things the Met doesn’t want to know about officially. In case it might upset them." These stories also not only feature a wide array of non-white characters (as would be appropriate in a city as multicultural as London), but have quite unique in our literature approach of actually integrating race in the story, casually mentioning race in the description of many white characters, thus subverting the unspoken rule that only non-white characters' race needs to be specified since white is the assumed default. No, here race is just one of the descriptors, applied to white people as well, and that reads very refreshing and common-sense. The humor of this book deserves a separate shout-out. It's very British (I assume, not being British myself), quite dry, quite intelligent. Combined with the uber-Britishness of this book (again, assumed by me, a non-British reader) it creates a very memorable and very British setting, requiring me - happily - to resort to Google a few times to make sure I understand what's being said and why it's funny. Broken Homes is very much a middle-of-the story book. The threads started in the previous three - including the greater and greater focus on the villainous Faceless Man - continue here without much hand-holding from the author to remind you where we left off. This book counts on you being quite familiar with the characters and events from the preceding three as it throws you right in the middle of continuing storyline. The flipside of this is that you should not expect all - or even some - of the storylines pursued here to wrap up by the end of this book; no, they will continue into the sequel as by now they all are just little threads of one larger story, leaving you in the meantime with hanging burning questions and no satisfaction of having them answered yet. "See, I thought as I waited for the lift, someone tries to kill you and suddenly you’re all cautious." Peter Grant ("I could have used my magical abilities to get a closer look, but instead I used the zoom function on my phone"),Lesley May ("[... ] whose attitude toward taser deployment was that people with heart conditions, epilepsy and an aversion to electrocution should not embark upon breaches of the peace in the first place") and Thomas Nightingale("Nightingale gave me the same long-suffering look he gives me when I accidentally blow up fire extinguishers, fall asleep while he’s talking, or fail to conjugate my Latin verbs") are pursuing their leads to uncover the identity and the associates of the mysterious and dangerous Faceless Man while solving a few murders, a theft, establishing a connection of a sink estate to all of this and policing a supernatural deity fair - all while trying their best to stay alive and caught up with paperwork. It starts with the usual lighthearted humor full of witty banter, but somewhere around the halfway mark the tone becomes more and more serious as Skygarden becomes the primary investigative location, and not only social issues are raised to the surface with apt social commentary (for instance, the struggle of the mostly poor inhabitants of the estate taking up space that could have been used for something infinitely more lucrative) but also the long-standing character tensions come to light, including Lesley's painful struggle to live with her 'ruined' face and the toll it takes on her - sometimes too subtle for Peter to actually see. And then, like a punch in the gut, the ending comes - unexpectedly and yet not that much, as throughout the book little clues were dropped alerting you that something was amiss, something was different, something was about to crack. And yet, whether you saw it coming or not, the impact remains - both on Peter and the reader, making me immediately go and look up when the next book in the series is due (and resolving to buy it as soon as it comes out, even if I have to pay for the extra shipping from Britain). It's painful and sad and leads to so many questions, and having your heart break for Peter just a bit. 4.5 stars and the countdown to the next book release begins. "Sometimes, when you turn up on their doorstep, people are already expecting bad news. Parents of missing kids, partners that have heard about the air crash on the news— you can see it in their faces— they’ve braced themselves. And there’s a strange kind of relief, too. The waiting is over, the worst has happened and they know that they will ride it out. Some don’t, of course. 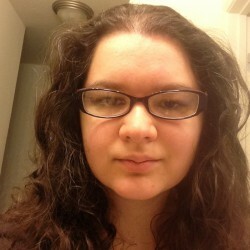 Some go mad or fall into depression or just fall apart. But most soldier through. But sometimes they haven’t got a clue and you arrive on their doorstep like god’s own sledgehammer and smash their life to pieces. You try not to think about it, but you can’t help wondering what it must be like.